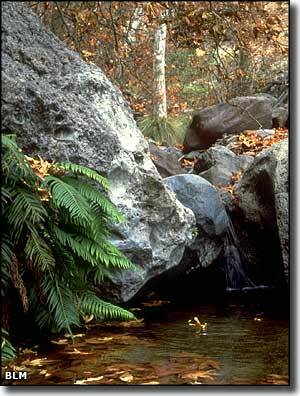 The 129,800 acres of Arrastra Mountain Wilderness are remote and a little hard to access. But the few people who do get here are greatly rewarded: imposing and colorful landscapes, wild geologic formations and huge, untrampled wilderness. The Poachie Mountains run from southeast to northwest across the north-central part of the Arrastra Mountain Wilderness, rising to almost 5,000' along the way. The southern slopes of the Poachie's drop more gradually than the northern slopes and are cut by several drainages, some of which have seen water flows cut deeply through the rock layers into an underlying bright orange mudstone. East of the mountains is Peoples Canyon, an area where several flowing springs feed into a 2-mile stretch of interconnected pools: a bird-filled riparian area shaded by hundreds of big cottonwoods, sycamores and willows. The seasonal waters of the Santa Maria and Big Sandy Rivers flow across the southern and western portions of the wilderness. And on the west side is Artillery Peak, a 1,200' volcanic plug rising in the Artillery Mountains. There is a shortage of good road access to Arrastra Mountain Wilderness, and no trails to follow if you do get here, so you'll most likely have the whole property to yourself. The terrain tends to be extremely rugged but there are a few old jeep trails that allow easier access in some areas. Most folks do their hiking along the sandy washes that disect the area. In the uplands areas you might come across some old burro trails left over from historic mining days. If you go out here, keep in mind that this is about as close as it gets to true desert wilderness, and you'll be completely on your own for the whole of your visit. As beautiful as this desert area is, it is not user-friendly. Recommended time for visiting: between October 1 and April 30. Arrastra Mountain Wilderness borders the Tres Alamos Wilderness to the south and Alamo Lake State Park to the southwest. With good high clearance (and you might still want 4WD), you can follow 17-Mile Road or go to Palmerita Ranch to access the Arrastra Mountain Wilderness. For 17-Mile Road: at milepost 143 on US 93 (about 60 miles north of Wickenburg) go west on 17-Mile Road for 6 miles to the wilderness boundary. From that point there is an old jeep trail going south that gives access to the Government Wash area. 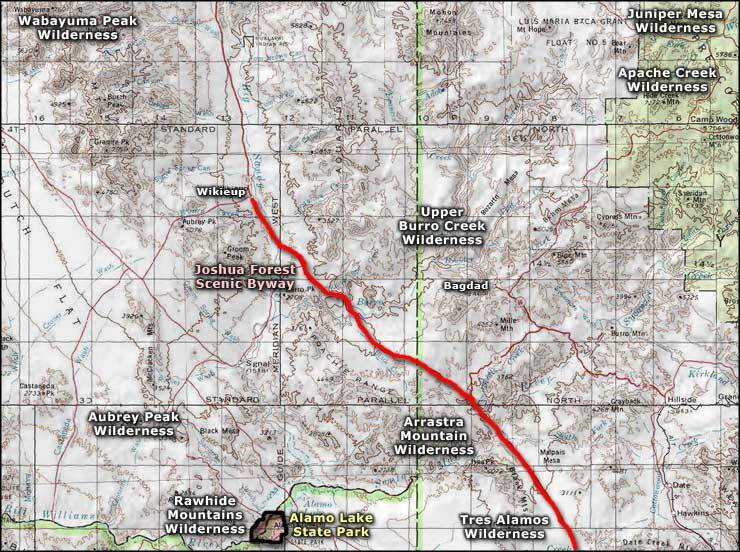 17-Mile Road also continues west for another 5 miles along the northern boundary of the wilderness. Palmerita Ranch is just north of Alamo Lake State Park. There is a parking area there that gives access to the south side of the wilderness and the western Santa Maria River area. Most of the photos on this page are from the Ives and Violes Peak area along Black Canyon Wash on the eastern edge of Arrastra Mountain Wilderness and south of the Santa Maria "River." Clicking on any of the photos below will bring you a larger version (800x600) of that photo. Photo of People's Spring and map courtesy of the Bureau of Land Management. 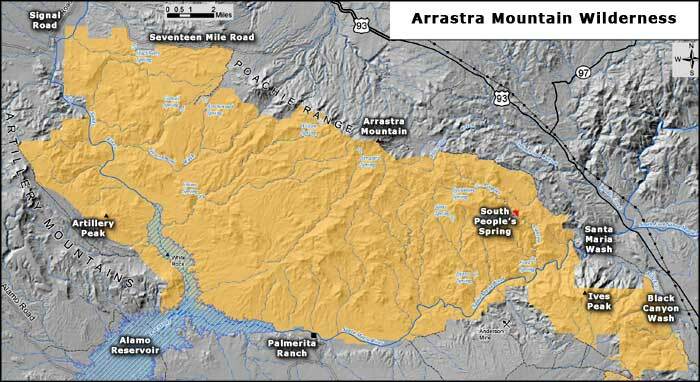 Area map of Arrastra Mountain Wilderness courtesy of National Geographic Topo!